How Do People Shop For Houses? Seventy THOUSAND people will search for a mortgage this month, and 51,000 homes will be purchased. Not only is buying a home a huge financial undertaking, it has a massive impact on the quality of your and your family's lives. We wanted to better understand how people make this consequential decision and how community financial institutions can win their share of this business. We turned to Google and Moz, a search engine optimization consulting firm, to answer these questions, and what follows is an analysis of the steps consumers take based on the volume of searches they make. Should I Even Buy a Home? Is it smarter to rent or buy? Is it a good time to buy a house? Those queries tell us that what consumers are really seeking is confidence: They want to know whether they are making the smartest financial choice. This is especially true for Millennials, who had their confidence rattled by the 2008 recession during their formative years. People are looking for expert analysis on the current market, local price trends, and the financial benefits of buying a home, such as building equity and receiving tax benefits. Using Google Trends, we can see that these kinds of searches peak around January and July. Interest in mortgage-related topics drops from August through December. Community banks and credit unions can meet this demand by increasing their blog content, social media posting, and paid advertisements during January and July. ...and by looking at the top keyword searches by volume. Notice how mortgage calculators feature prominently in the following results. This suggests that people are worried less about the total cost and more about what they could afford with a comfortable monthly payment. Most consumers think less about the long-term cost and more about the impact home ownership will have on their current cash flow. It's part of the reason most of us are so bad at saving for retirement. Because they're more concerned with present-day cash availability rather than long-term cost, consumers are often seeking the maximum amount of house they can purchase with a monthly payment that they can afford. 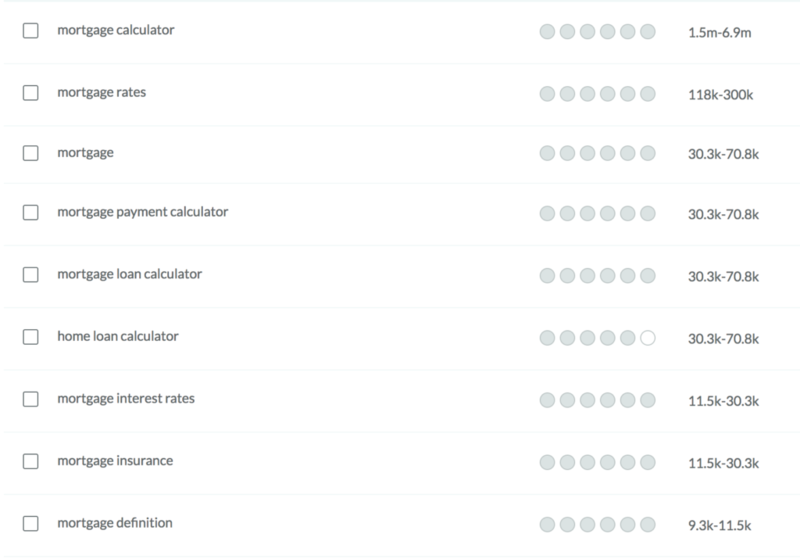 Calculators are great at answering this type of question because they allows the consumer to play with multiple variables (like interest rate, purchase amount, and payment) and see how the results change. As consumers work to pin down their budget, they will likely have other questions. Again, we can see some of these by looking at breakout queries in Google Trends. Can I buy a house with bad credit? This presents financial institutions with an incredible opportunity to make helpful content for their consumers. Now comes the fun part. Once consumers feel like they have a handle on the financial aspect, they begin to search for houses in the area that meet their criteria. This is a screenshot for keywords associated with searching for a home as pulled from Moz. You'll notice that the volume of search here is much lower than at the previous stage, indicating that some people dropped. When searching for a new house, consumers often add "near me" to the end of their query. For example, "townhomes near me" or "condos for sale near me." Another variation of that search is to add the zip code: "houses for sale 77007." It's important to note that most of this step is done on 3rd party platforms like Zillow or Trulia. According to Zillow, 80% of first-time homebuyers use their platform. 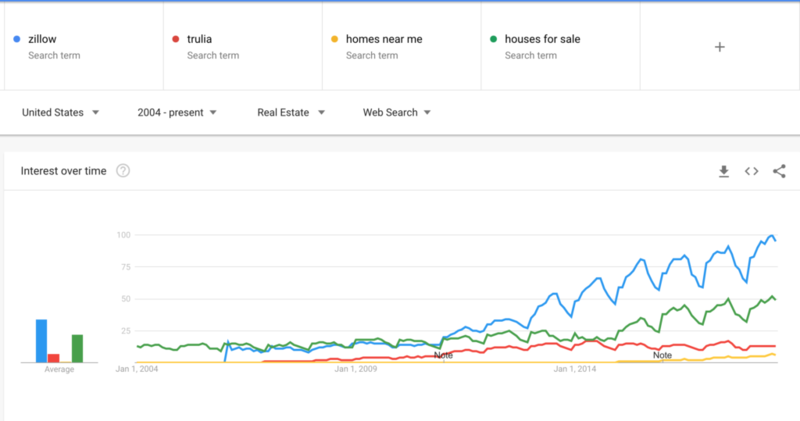 In this Google Trends screenshot of the Real Estate category, we can see that searches of those two apps have been trending upwards and Zillow is the preferred search platform. Google also features these platforms prominently in their search results. Most of these platforms allow consumers to begin finding a lender within the platform. Knowing that such a high volume of shoppers use these 3rd parties, institutions that want to compete should be sure that (1) they are listed and (2) they have a positive review. For more information, check out Zillow's and Trulia's lender guides. There might be questions that pop up at this stage of the process, like "How do I buy a house in foreclosure?" or "How do I buy a house at auction?" Consumers have finally found the house of their dreams... or close enough to it that now they begin to search for financing. As we've already mentioned, a large chunk of those prospects will search through Zillow or Trulia for their financing. The remaining chunk will head back to Google to comparison shop. Again, we can see a big drop off in search volume at this stage of the funnel. A word of caution: At this stage of the funnel, we begin to see a lot of branded searches. Consumers start to search for mortgages at specific institutions, which means your odds of winning their business is much lower. This puts added importance on effectively marketing in the previous stages. At this point, consumers have typically begun working with a specific institution. Even if you haven't won their business, there are still plenty of opportunities to attract them. Consider building content around home ownership and position yourself as the go-to when they seek a HELOC or home improvement loan.